The Illio-Psoas Muscle is a common contributor to hind end lameness, toe dragging, lead issues, pelvic and stifle problems. It is a main core muscle that we sit on while riding, and is key in lifting the hind leg forward and helps connect the horse into one cohesive dynamic unit. The psoas muscle originates along the side of all lumbar vertebrae, the last two ribs, merges with the illiacus muscle in the pelvis; and inserts on the inside (medial) upper (proximal) femur. However, after working with thousands of horses, I have found that it’s rarely just an illio-psoas muscle issue, rather it’s a kidney problem! 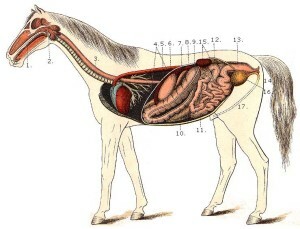 If a skilled equine therapist only addresses the illio-psoas muscle, the condition will return, often with greater severity, because the underlying cause has not been addressed. Organs are a primary cause of all lameness. They “trump” muscle, bone, and vertebra. In osteopathy, we call this “visceral somatic dominance” and it is a huge component to truly healing lameness in all animals including riders. Every organ has at least one muscle it will affect when in dysfunction. I have never seen a hind end lameness which did not have some organ causation. When a kidney goes, even slightly into imbalance, it will go into spasm. It then automatically causes the illio-psoas muscle to go into and stay in spasm– resulting in tension along the loin, pelvis and upper femur. Chronic kidney/illio-psoas imbalance can, and will lead to stifle/hock issues. If you apply deep vertical (dorsal-ventral) pressure 3 inches from the lumbar spine, a weak Psoas muscle will result in a spasm and weakened entire hind leg response. Even a small reactive weakness is positive for significant impulsion issues. By clearing kidney imbalance, the illio-psoas muscle instantly resets to normal in 95% of all cases. Acupressure is a great way to reset the kidney and thus the ilio-psoas muscle. You can do this easily by using Bladder 23 (the kidney association pt.) and Ki 3. The kidney meridian is paired and runs on each side of the body. Work Bl23 and Ki3 on one side at a time. Right kidney issues are much more common than left (rationale is fully covered elsewhere, and in IET course work), therefore you will see more right psoas muscle spasms, and left- lead issues owing to a weakened right loin core. Put one hand on Bl23 the Kidney Association Point. It is located on the bladder meridian directly up from the curve of the ribs, and the other hand on Ki3 located in the hollow curvature of the medial hock. Ki3 is a potent source-point for kidney. Use soft steady pressure with both hands. Concentrate, set your intention on sending, allowing your energy to flow out of both hands simultaneously, into the horse. Be aware of how the tissue feels, and how the horse is responding. As you gain more experience, you’ll feel a 1:2 rhythm, or separate pulses coming from each hand… then a stillness…. followed by a stronger, even, individual pulse in each hand; and the horse will usually exhibit significant signs of releasing. This signifies the meridian has unified its flow much like a hose that was somewhat kinked and you correct it to flow evenly and smoothly. This is closure for standard acupressure as taught throughout the world. However, horses taught me years ago, that there remains a much more profound level of letting-go and rebalancing. I see the meridian system as an interface between superficial and deeper systems of the body. Standard acupressure resets meridian flow, but not necessarily the deeper connections to neural, vascular, organ, soft tissues, and bone. What sets Dynamic Acupressure apart from the clear majority of acupressure and even acupuncture in practice today, is the emphasis upon enhancing meridian flow and influence, and nudging meridian releases to allow structural and neural resetting that would otherwise not occur. Melding with the core rhythm/ frequency of the horse allows greater access to the meridian system and, immeasurably increases effectiveness and efficiency. As you learn to feel and read the meridian pulse and quality of flow- you’ll feel the tissue come to a crescendo, where the body is asking you to go deeper and help it readjust structurally and more fully. All students will be able to feel this energy imbalance, and then follow it through the enhancement phase (standard acupressure), to the crescendo and nudge (dynamic acupressure) through the resetting. Stay with the resetting until it feels complete. This allows you to truly feel the structural movement and shift, which gives you great verification of your efficacy, and confidence to attempt deeper techniques. In this example of the Kidney/ Psoas Muscle Connection, complete the previously mentioned standard acupressure technique. Then using the same acupoints Bl23, and Ki3- allow your energy to flow fully into the tissues deep below these acupoints. You will commonly feel the entire leg reset as the psoas muscle suddenly relaxes. This will reset the medial torsion on the femur, relax the stifle, and often cause the hock to self-adjust in your hand. Reassess the psoas, challenge it with deep dorsal/ventral pressure to assure yourself how powerful this technique truly is. 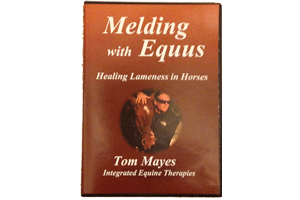 This technique is particularly effective before, and during equine events; such as eventing, dressage, endurance riding, reining, cutting, long trail rides, etc. Rebalancing kidney/psoas will have an immediate outcome on emotional and physical relaxation in the horse, as well as noticeable increases in impulsion, smoothness and straightness. In following articles/videos I discuss further the implications of kidney urinary imbalances; how they commonly cause sacral/pelvic misalignment, bladder/urethra (sheath) inflammation, and are a primary holding pattern for profound fear in the horse. Additionally, I cover osteopathic techniques used to fully correct this pattern of biomechanical, metabolic and emotional dysfunction.